This week, I finally started our Antarctica and expository text unit. One thing I love about this unit is that students learn so much by reading multiple texts on one topic. They see how authors can use different main ideas and text structures even when writing about the same topics. Over on Frolyc, I've put together several sets of texts on one topic. One set is focused on chinstrap penguins. Kids love reading about this little bird, and I've loved converting my paper lessons to digital format. Another set is focused on peregrine falcons. It seems that students everywhere are fascinated by these birds! 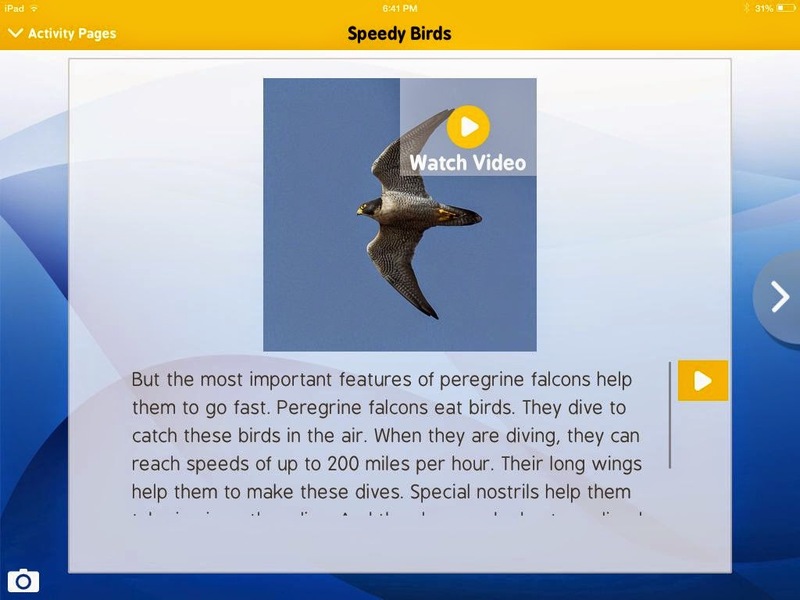 What is a Peregrine Falcon? Reading multiple texts on the same topic--and watching the carefully chosen videos--helps students to build connections and understand complex ideas. Here is a speed drill that I made for a set of texts about landforms of the Northeast. I included the names of the states because, if nothing else, I want kids to be able to pronounce Connecticut! The second speed drill, which I made for "Groundhog Day" by Lillian Moore, includes some words that are not in the original text. The group that I was working with was having trouble with visually similar words, and I wanted them to practice reading words with different endings. Just reading the speed drill can be kind of monotonous. Luckily, my husband (who teaches third grade) taught me Goldilocks Readings. 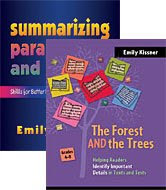 It is so much fun, and so helpful for intermediate readers. Of course, during our slow reading of the words, I exaggerate the syllabication and the emphasis. It only takes one read-through for kids to pick up on this process and they enjoy slowing down their reading as well. On some speed drills, I add questions to encourage students to make predictions. On others, I include questions about word awareness and vocabulary use (find the compound words, look for synonyms, etc.) But the speed drill doesn't become a long vocabulary task. Instead, we keep the focus on read the words with accuracy and getting ready for the real reading task--because that is where we are always, always going! This year, I am lucky enough to have my own son in reading class. 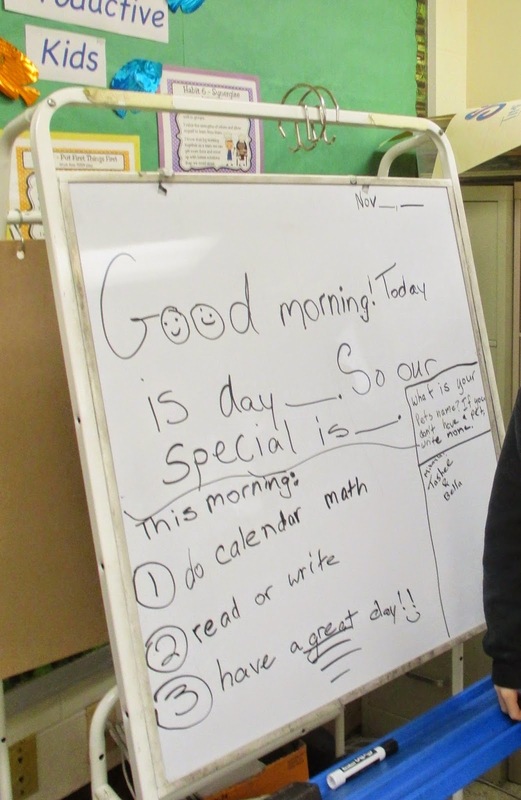 I teach at a tiny school, with only two fourth grades. My wonderful colleague teaches both math classes, and I teach both reading classes. It's been great to have my son in my class, and not only because at least one person will get my Dr. Who references. 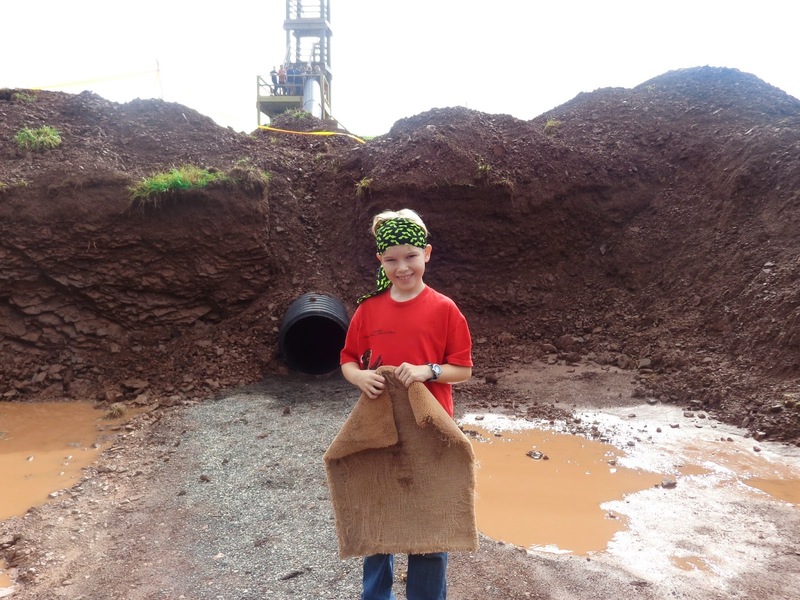 Seeing fourth grade through his eyes really helps me to see what works and what needs to change. I had better not skip it. Ever!!! Or I will hear about it at home. Watching my fourth grader become responsible is such a joy...and having a predictable homework routine in the classroom really facilitates this. I like it as both a teacher and a parent. Last week, students took an assessment with a passage-based essay. At dinner, my son asked, "Did you write the story for our test today?" "Yes," I replied cautiously, ready for fourth grade criticism. "Well, I think that if you added more to the end of the story, the essay would be easier. Like tell us more about how Casey feels at the end." Taking one of my students home each day really helps me to see how all the little classroom practices fit together. It makes the pathway toward summer a little bittersweet, as I realize how soon he will be off to fifth grade. Luckily, the lessons I learn from him will last. A few weeks ago, as I was reading aloud to students, I stumbled upon a kind of context clues that young readers often miss. Appositive context clues are very common in expository texts for young readers, and they are often misunderstood. A skilled reader has no trouble matching the word phytoplankton with its definition. After all, the two ideas are right next to each other in the the sentence! Without the first comma, the meaning of the context clue is completely lost. Actually, it's worse than lost--by logical reasoning phytoplankton couldn't be tiny ocean plants. On a test question, students would confidently choose anything but "tiny ocean plants" as the meaning of phytoplankton, because by their reading the sentence clearly states that phytoplankton is something different from tiny ocean plants. Once I realized that my students didn't know the meaning of the first comma, I knew what to do next. I had to show them lots and lots of examples of appositive context clues! I also had to make sure that they were carefully reading and attending to punctuation. After just a few examples taken from our read alouds and written on the board, students were able to answer questions related to the context clues with confidence. They noticed the commas setting off the appositives as the important signposts that they are! This year, I've been experimenting with doing more open-ended, engaging play with my fourth graders. It's not easy to do this in the face of increasing test pressure. Every day I wonder, "Should I put away the hands-on materials and get out the test prep?" This thought is usually accompanied by an increasing heart rate and a tightness in my chest as I think about my value-added scores for next year. But I know that my students deserve more than the narrow band of learning the tests represent. They deserve a real place of learning and collaboration. Or--really--a place where they can play at the sink, where they can keep a stinkbug as a pet, where they can build with the Erector set--"Mrs. Kissner, we don't have a piece that we need but we'll improvise. We're good at that"--where they can start a business making bracelets and have time to write down the stories that they are thinking of and use Google maps to find where they went on that last vacation their whole family was together. They deserve to be able to use the science materials again and again, not just on one day, and to explore and immerse themselves in lots of different kinds of activities. As you can probably guess I feel passionately about this! I spent a great deal of time thinking about centers over the holiday break, considering where I wanted students to go. One concern that I have felt is that kids flit from activity to activity, and don't slow down to really explore a topic in depth. As 9 year olds mature into worldly 10 year olds, many of them are ready for deeper investigations. Last week, I introduced learning contracts to students. These contracts are basically classroom agreements for an individualized activity. As you can see, there are places for the student and teacher to record when students will work, whether they will need to work on the project at home, and what specific steps they will need to complete. ...And students were very enthusiastic! 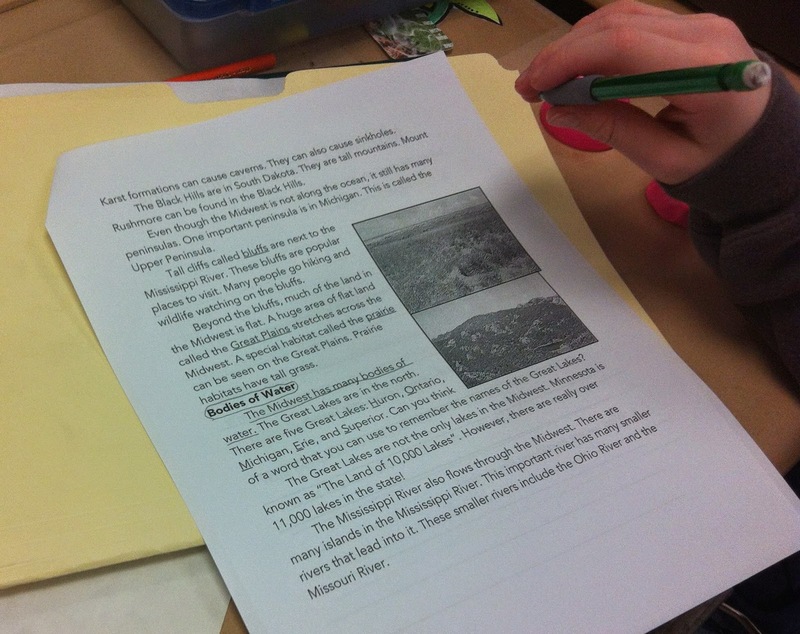 Many students are writing reports about topics they have studied in the past. One student is making a periscope. Two students are writing a play together, and another went home and found an essay he had written in third grade and wants to type and revise. 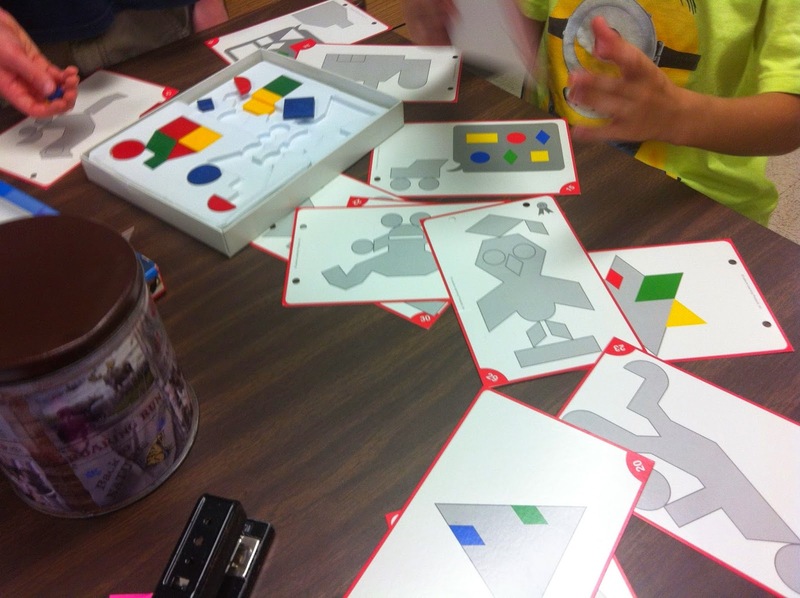 The free exploration of centers is naturally settling in to some more focused, sustained exploration--just what fourth graders need developmentally. I love expository fiction! This kind of writing uses the structures and conventions of expository writing, but with fiction details. For kids of all ages, expository fiction is fun because kids can play with the expository genre while still having complete control over every detail. Over the years, I've done several different projects with this kind of writing. One of my favorites was "Fashion-A-Fish", based on the Project WILD activity. After creating a fish, students wrote about the adaptations and shared their imaginary creatures in a class guidebook. This is my example. So much fun to make! "Mrs. Kissner, what's a bay again?" "Well--it's kind of like the opposite of a peninsula. Think an area of water, surrounded by land on three sides." and, next week, writing an outline. We'll be learning about introductions, conclusions, and transitions over the weeks to come. What makes this kind of writing so engaging for readers is that they control the details. Need more information? They just go back to their maps, bounce some ideas off their neighbors, and weave in the interesting details. There are so many other options for expository fiction. It's a great way to help kids learn about expository writing! When it comes time to summarize stories, many intermediate readers just don't know what to do with the dialogue. They know that dialogue is important, and that it carries information. But they also know that they shouldn't include too much dialogue in a summary. The great news is that teaching readers how to summarize dialogue is pretty fun. "Don't include dialogue in a summary" is easy to say. But what should readers do instead? This is what we practice! Short, funny skits are the ideal tool for this. Here is one that students read in small groups after they finished their passage-based essays. You can imagine the laughter that spread through the room as students progressed further into the script! So then students perform the script, and we talk about how to summarize the dialogue. What happened? With imaginary rewind buttons we can have the performers repeat parts of the script as necessary--very fun--and we have been known to mute them on occasion. A list of words to summarize dialogue is helpful. I love word lists in general because they are such an efficient way to build word knowledge quickly. Many readers will return to word lists weeks and months after a lesson to find just the right word for an activity. If you have students struggling with summarizing stories, try spending some time on summarizing dialogue. You'll hear some interesting insights and have great conversations! Summarizing Stories includes more activities for summarizing dialogue, as well as the script and word list included here. I write a lot about individual lessons and activities, but sometimes I forget to talk about the deep routines in the classroom. One thing that I love is a classroom economy! It runs totally in the background of the classroom (well, usually) and solves many daily problems. Basically, kids earn tickets in various ways and then can use those tickets for different purposes. How do kids get tickets? The basic way to get tickets is to do a classroom job. For other ways, the answer differs as the year goes on. Early in the year I would give kids tickets if I accidentally called them by a sibling's name--much to the delight of my younger son! Sometimes I also give tickets for random tasks, like stapling book orders or cleaning up from a science experiment. As the year has gone on, students also get tickets when they remove 5 vocabulary cards (you can read about the vocabulary system here). But most students earn tickets through contracts. How do they get the contract? Students see a problem in the classroom and write a contract to fix it. Right now students are passing out reading binders, doing the lunch count, taking care of the bird observations and bird feeder, erasing the whiteboard, and, yes, keeping track of all of the contracts! Kids write the contracts themselves, which makes for interesting conversations and an authentic reason for writing. What do you intend to do? How often will you do it? Once their contract work is complete, they fill out an "invoice" that I sign. How do kids use tickets? I also auction things off once or twice a cycle. These things include donated little toys, books and bookmarks, school supplies, and other randomness. Such a great way to get those odds and ends into good hands! Well--it's different every year. It's always interesting to see how kids make the system theirs. I don't allow students to bring things from home to sell for tickets, although kids do try to do this every year. Sometimes kids start businesses. Right now, some students are making friendship bracelets and "selling" them during indoor recess. Another student is selling drawings. One student purchased the rights to a fancy set of fine line markers, and rents them during recess. When students kept forgetting to move their lunch cards in the mornings, the student in charge of the closets proposed a win-win solution: If you don't move your lunch card by announcements, you have to donate to ticket to the Popcorn Party envelope. During indoor recess, we found that we were going through construction paper at an alarming rate. A student came up with a tiered payment system. Now, using recycled classroom paper is free, while construction paper has a ticket cost. The area by the door to my classroom is covered with student-created posters, advertising their various goods and services. Students are even considering marketing and how to connect with customers. After the Hour of Code, one student even offered computer programming lessons! ...are not actually a big deal. I say to students early on--this is supposed to be fun. And students really treat it as such. We talk about safe places to keep tickets and the need to be responsible. There are minor problems with dropping tickets here and there, but nothing major so far. And I've done versions of this for four years. All in all, our classroom economy is a great routine to have going on in the background. Lots of fun and room for discussion and growth! -I finally finished Exploring Point of View! This includes two original stories--one written in a shifting point of view, and the other written in first person point of view. Over the past two years, I've been working with Frolyc to create activities for student iPads. It has been a wonderful experience to see the Activity Spot app grow and change. Now, teachers can add text, pictures, web links, and video. 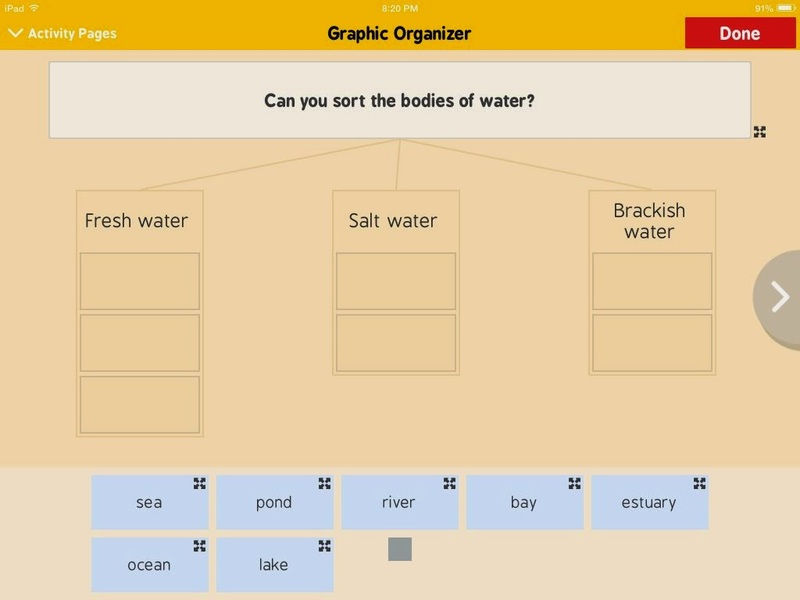 Students can respond with drawings, open-ended responses, fill in the blank responses, and drag and drop organizers. Teachers can see student responses in real time. Over the break, I spent time cataloguing the activities that I have created. Wow--I have created and posted 130 different activities! At first, much of my work focused on learning the affordances of the app--what could I do with it? What could kids do with it? What regular classroom tasks could the app encompass? In the past few months, I've become much more strategic, trying to put together sets of activities to complement units of study or classroom topics. And all of this has been happening at a time when I have been learning all that I can about digital literacy and multimedia in the classroom. 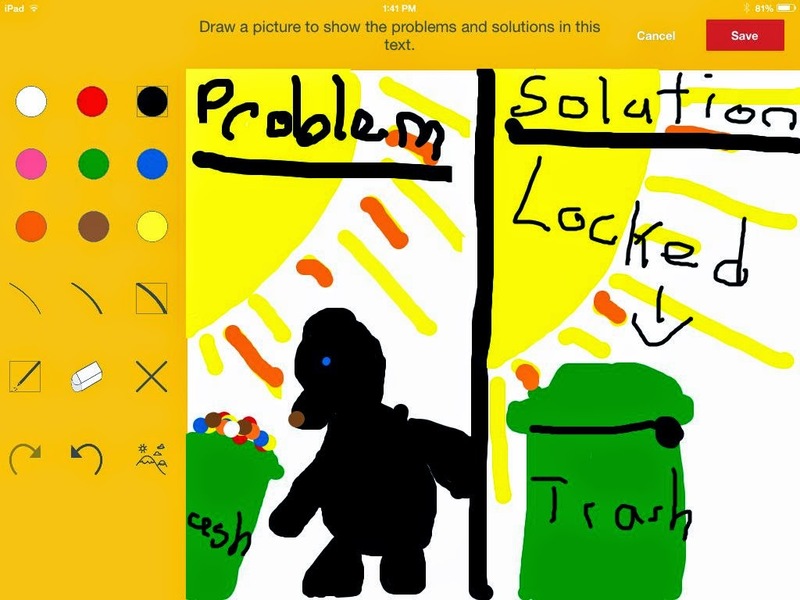 Activity Spot is the perfect tool to help students transition into critical thinking about multimedia. Texts, videos, pictures, and web links are right there for students to explore. Here are some of my favorite activities! Some are premium activities, while others are free. Black Bears and People: This is another problem and solution text. I love looking at the pictures that readers create to go along with the text! What is Mass? 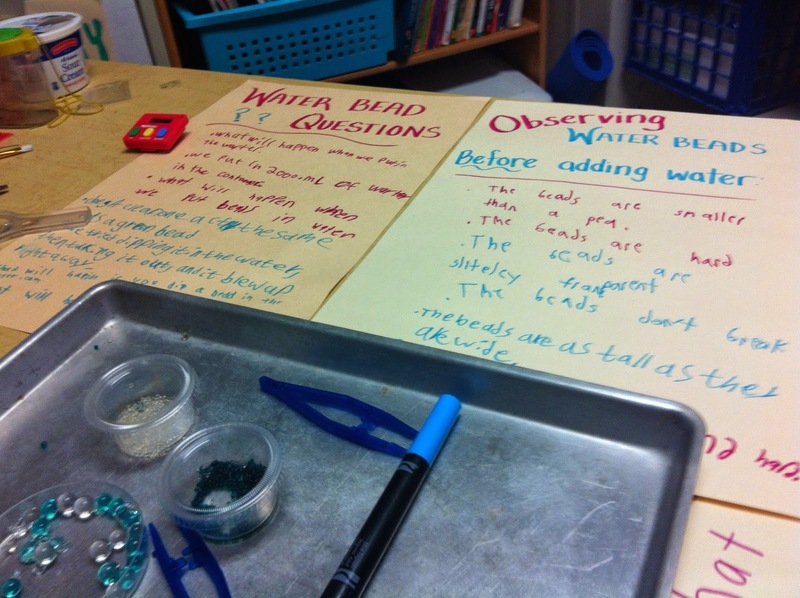 : This activity is an example of how Activity Spot can be used for science instruction. Students read about the difference between mass and weight, and then think about which tools are used for measuring these properties. Energy Flow in Ecosystems: Picture the scene--a holiday party with grown-ups, kids dressed in their best clothes, surrounded by breakable Christmas collectibles. How can I amuse 8 and 10 year old cousins? With learning, of course! This picture shows what my son and nephew created after they read about energy flow in ecosystems. They used the camera roll on the iPad, found the awesome praying mantis picture, and labeled it. My proudest moment. 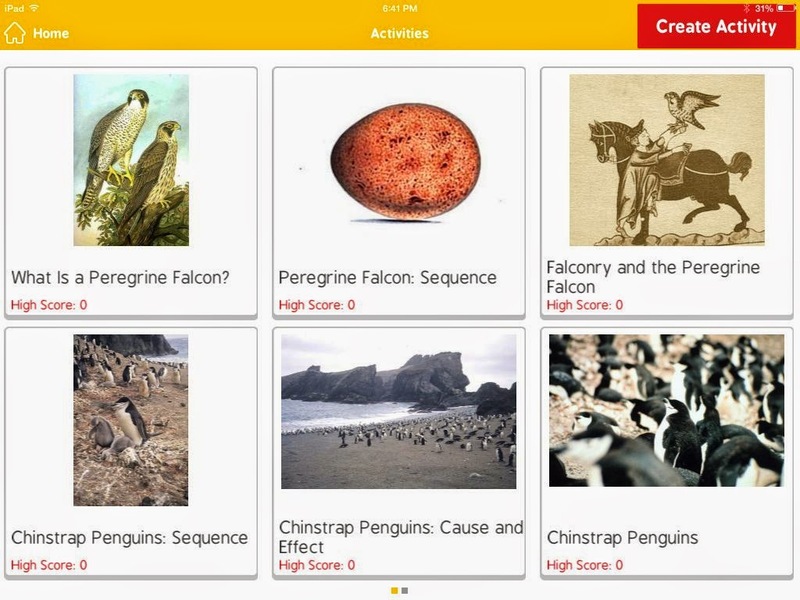 Emily Dickinson: I really like how this activity uses the capabilities of Activity Spot. Students learn about Emily Dickinson's life, and then view a video that highlights her use of imagery. Finally, they look at a commercial for "Emily Dickinson's Garden" to consider elements of author's purpose. Endangered Species: The web features some fantastic writing, and with Activity Spot, you don't have to print and copy digital texts. This activity includes a link to an article from the US Fish and Wildlife Service highlighting lesser-known endangered species. After reading the article, students compare the text to a video, making this a great activity to help readers compare different kinds of text. This is only a small sampling of the texts and activities that are available. Other teachers are creating and sharing as well. In the next few weeks, I hope to add even more informational texts. If there are activities you would like to see, fee free to request them here or on the Frolyc site. Do you have lesson ideas that you'd like to add? You can create your own free and premium activities on Activity Spot! Visit Frolyc.com to learn how.